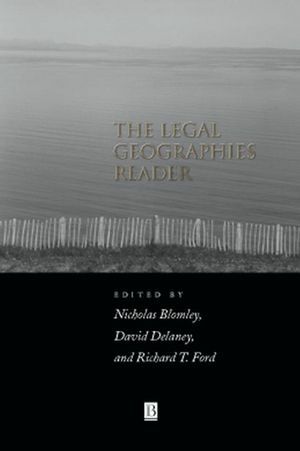 This timely Reader brings together, for the first time, key writings on the relation between law and geography in an effort to clarify the connections between these two increasingly complex concepts. Nicholas Blomley is Associate Professor of Geography at Simon Fraser University, Vancouver and the author of the highly acclaimed Law, Space and the Geographies of Power. David Delaney is a lecturer in the Department of Law, Jurisprudence and Social Thought at Amherst College, Massachusetts and the author of Race, Place and the Law. Richard T. Ford is Associate Professor of Law at Stanford University, California and has published in the Harvard, Stanford and Michigan Law Reviews and internationally in legal and social science journals. Preface: Where is law (David Delaney, Richard T. Ford, and Nicholas Blomley). 1. The Annihilation of Space by Law: The Roots and Implications of Anti-Homeless Laws in the United States (Don Mitchell). 2. Controlling Chronic Misconduct in City Spaces: Of Panhandlers, Skid Rows and Public-Space Zoning (Robert. C. Ellickson). 3. Girls and the Getaway: Cars, Culture, and the Predicament of Gendered Space (Carol. Sanger). 4. Out of Place: Symbolic Domains, Religious Rights and the Cultural Contract (Davina Cooper). Section 2: Local Racisms and the Law. 5. The Boundaries of Responsibility: Interpretations of Geography in School Desegregation Cases (David Delaney). 6. Polluting the Body Politic: Race and Urban Location (David Theo Goldberg). 7. The Boundaries of Race: Political Geography in Legal Analysis (Richard T. Ford). 8. The Legitimacy of Judicial Decision Making in the Context of Richmond v Croson (Gordon L. Clark). Section 3: Property and the City. 9. Landscapes of Property (Nicholas Blomley). 10. Residential Rent Control (Margaret Radin). 11. Suspended in Space: Bedouins Under the Law of Israel (Ronen Shamir). 12. Picturesque Visions (Simon Ryan) . Section 1: State Formation and Legal Centralization. 13. A Legal History of Cities (G. Frug). 14. Territorialization and State Power in Thailand (Peter Vandergeest and Nancy Lee Peluso). 15. Rabies Rides the Fast Train: Transnational Interactions in Post-Colonial Times (Eve Darian-Smith). 16. Law's Territory (A history of jurisdiction) (Richard T. Ford). 17. Property Rights and the Economy of Nature: Understanding Lucas v. South Carolina Coastal Council (Joseph Sax). 18. The Property Rights Movement: How it Began, Where it is Headed (Nancie Marzulla). Part III: Globalization and Law. 19. 'Let Them Eat Cake': Globalization, Postmodern Colonialism and the Possibilities of Justice (Susan Silbey). 20. The View from the International Plane: Perspective and Scale in the Architecture of Colonial International Law (Annelise Riles). 21. Border Crossings: NAFTA, Regulatory Restructuring and the Politics of Place (Ruth Buchanan). 22. Anthropological Approaches to Law and Society in Conditions of Globalization (Rosemary Coombe). This is the first text to define and sustain the significance of law in relation to geography. Brings together a range of readings which have, until now, been scattered in different publications, many not easily available. The editors are very well-known academics from a range of backgrounds providing differing perspectives to give readers a full picture. A highly topical subject which has a growing international audience.